"Recently, Eric gave us a "Beta" release of the manuscript you read here. He released these essays one at a time, and the reaction was overwhelmingly positive. People begged for more, and some said it had taken them 20 years to learn what Eric shared that day. Much of the advice is hard to categorize by any topic except one: this is advice from a professional. If you perform magic for a living, I am positive you too will appreciate Eric's advice." "What a great resource! There are so many things here that I wish I had known when I was "early in the game". These are pieces of information of real value to magicians out in the real world. This is almost a post-graduate course...you've learned your tricks, you know how to present them...now here's how to get work, keep working, enhancing your career and making all of your magic stronger." "There are two ways to gain the benefit of 30 years experience as a professional magician One is to work as a professional magician for 30 years. The other is to read Tips." Copyright (c) 2003 Eric B.Henning. "The book is excellent, full of wonderful ideas & material for all magicians, professionals and amateurs as well." "Practical advice from a working pro...word up!" over 50 pages of text. It is an "easy read" because he is a good writer. I felt as if he was sitting in my living room and we were talking to each other after 'sessioning.' "
"I've been a full time entertainer for 9 years, and could make the mistake of thinking that I don't need any tips on all those "behind the scenes" things that nobody ever writes or talks about. The wisdom and fresh ideas in your tips are great to read again and again, and would help anyone on their road to success with professional entertainment!" "Wow, Eric! What a wonderful, useful book! Just when I think I know it all or have seen it all, I am humbled by learning something new - and new again, chapter after chapter. . . I feel like you are talking with me as a friend in a very conversational style and as one knowledgeable professional to another. . .we all know and own enough tricks. We just need to know how to make them more entertaining and how to market ourselves better. Your tips give us another dimension that is rarely discussed outside of the secret sessions. Thanks again for making this available to the fraternity." "Eric's tips, hints and ideas are wonderfully written and presented. If you perform magic either as a hobby or as a profession, there are many, many fully polished gems just waiting for you to pick them up and use them to take your performances to the next level. TIPS is a must have book for anyone seriously interested in magic." "This is really some of the finest information I have ever read on being a performing magician. Here are the tips that you can ONLY get from years of performing experience. The magic world doesn't need new books on tricks, it needs more books like this one!! This is magic in the real world of performance." "Some of Eric's tips really resonated with me based on my own experience in the trenches, while others enlightened, informed and even cautioned me about situations and issues I haven't yet encountered. This is a resource I'll read and re-read." 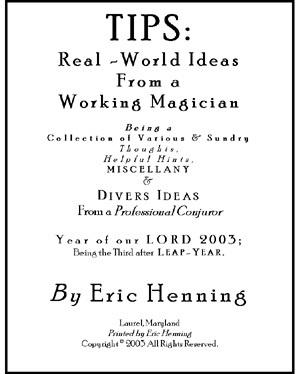 "TIPS: Real-World Ideas from a Working Magician is an invaluable collection of practical, tested ideas. Both beginning and experienced magicians will find useful material in this book. Highly recommended!" "I would buy this book before any other book on the latest card or coin sleights. Your tips have proven to be valuable information for the working. Every tip is worth its weight in gold. This is one book that EVERY professional should have." "Common sense info that you will use IMMEDIATELY! Keep this book handy at all times." "I read my copy of your book. I think it's a very useful addition to the body of magic literature. I got several good ideas from it. Your information on how to dress, sound systems, taking tips etc., are all real issues professional performers have to come to grips with, and your insights are invaluable." "If you had a personal mentor for your magic education, what sorts of things would they help you with? The little details, nuances, practical suggestions to improve your performances - that is what you would learn. How much would such advice be worth? Much, much more than the price of this remarkable collection of TIPS. So, you have a choice . . . get a tutor, or BUY THIS BOOK!" "The book is terrific. Even after two full-time magic careers (ten years, then fifteen) I found the book packed with the kind of inside information you get only from long professional experience." "Just a brief note to let you know that I've just received my copy of Tips, and would like to say a massive "Thank You" for such a wonderful book. The advice you have given within these pages is absolutely priceless. I really wish I'd had access to this when I first started performing 15 years ago."